For many with respiratory conditions using a device to help disperse medication into the airways and the lungs is common. Many are prescribed one of two devices, a inhaler or a nebulizer. Inhalers is dosed medication that is breathed into the lungs to help open the airways and calm down any muscles that are irritated. While nebulizers use a large machine that dispenses medication as a breathing treatment or “mist”, the user will wear a mask or mouthpiece and breathe in the medication for 10-15 minutes. Inhalers are small (no larger than the palm of your hand), portable devices that are used to administer medication when needed. Thinking of an aerosol can, an inhaler is a miniature form of that provides a single dose of medication at a time. There are multiple forms of inhalers, such as an metered-dose inhaler (MDI), dry powder inhalers (DPI) and soft mist inhalers (SMI), but we will be speaking about MDI inhalers. As you press the top of the inhaler (in most cases) a single “puff” is released for the user to inhale. Many inhalers have a dose counter, counting down the number of doses left before the inhaler runs out of medication. If the inhaler does not have that feature, it is vital to keep track of the doses, so you do not end up in need of medication and your inhaler ran out. MDIs are often a preferred device to dispense medication to the airways and lungs, normally requiring 1-2 puffs of medication versus 10-15 minutes of medication from a nebulizer. MDIs also provide fewer side effects from albuterol compared to the nebulized form of albuterol. The nebulized form of albuterol can cause an increase in heart rate, and tremors. MDIs are also cheaper than nebulizers, both in medication and supplies needed to use the device. For MDIs, they do not require any additional supplies and average $.40 to $.50 per dose compared to nebulized albuterol which averages $2 to $2.50 per dose. Metered-dose inhalers are a preferred method for many respiratory diseases, and often are a go-to for older children with asthma as well as adults. 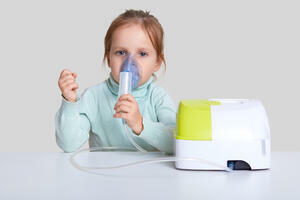 Nebulizers are often electric, requiring them to be plugged into the wall, but some are battery-powered. The size and shape of nebulizers can range drastically, often much larger than an MDI and requires to be on a table and plugged in while being used. These provide misted medication to the user through a mouthpiece or mask. This fine mist is breathed into the lungs to help calm the muscles in the lungs. Nebulizers are perfect for young children, as they just need to breathe normally and don’t require any additional steps. It is possible to have them sit and watch tv while they do their breathing treatment for 10-15 minutes. Nebulizers require medication to be added to a medical cup that is attached to the nebulizer and is then turned into mist before it reaches the users mouth. One of the flaws of nebulizers are their constant requirement to clean them in order to prevent bacterial growth. Nebulizers are otherwise beneficial to some with COPD and like respiratory conditions, as they are easier to use than MDIs. 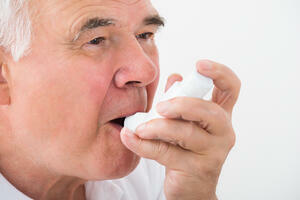 Many with respiratory conditions are unable to take a deep breath and hold it, which is what inhalers require. Nebulizers can be beneficial in this way, as the user only needs to breathe regularly and not focus on holding their breath. When deciding which device is best for you, an inhaler or a nebulizer, it is important to look into a few factors. Your doctor may find a specific device is best for your disease and your current health. You may also prefer a quick form of medication, so it can also depend on your preference and lifestyle. Insurance can also play a role in what you want to use to take medication, as some nebulizers and inhalers aren’t covered by insurance. You should feel comfortable using whatever device you choose, as it will be something you need to use frequently. Many people chose inhalers for the size and convenience, but they are easier to use incorrectly. If using an inhaler is too difficult for you, it may be easier to have a nebulizer on hand and use it regularly. 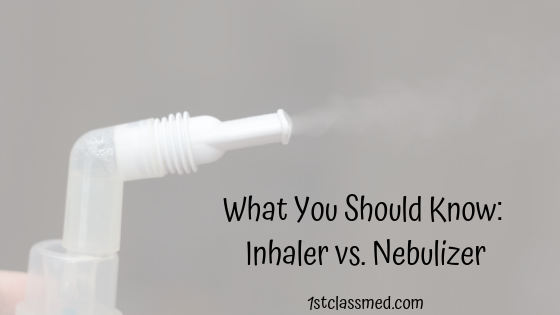 Though inhalers and nebulizers both seem relatively easy, they can actually be very difficult to use. Once it is determined by your doctor that you need an inhaler or nebulizer, ask them to demonstrate how to use it, and then try for yourself. This should hopefully prevent you from misusing the device and get the maximum amount of medication into your lungs. It is also beneficial to go over all instructions that come with the inhaler or nebulizer to better understand the specific model. If the device doesn’t seem like it is helping, speak with your doctor to see if there is a step you are missing or if the device isn’t right for you. Both inhalers and nebulizers can be helpful for those with respiratory issues by providing medication directly to the lungs. There are perks for both devices, as it depends on the individual and their preference for which one they like better. It is best to discuss with your doctor about what device will work for you, both in convenience and effectiveness.